Carnegie: Magic Detective: The Man Who Left Houdini Hanging, Or Did He? The Man Who Left Houdini Hanging, Or Did He? 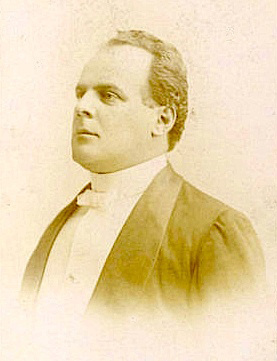 In the Spring of 1900 Martin Beck, Houdini's manager had made arrangements with an international agent named Richard Pitrot, to book a tour of Europe for Houdini. When Houdini arrived in Europe he discovered there were no bookings and had to take things into his own hands. It sure seems odd that a successful and up and coming artist like Houdini would be left totally helpless in a foreign country. In fact, it also seems really strange that a person known for booking acts internationally would be the person who dropped the ball. Was this just another part of the Houdini legend or what happened? I'm not really sure, but let's begin with the agent. Richard Pitrot was born in 1851 in Europe and began his career as a performer. He was what we could call today an impressionist, meaning he did impressions of famous people. He was billed as 'The Monarch of Mimicry'. His two best impressions were of Presidents George Washington and Abraham Lincoln, according to the book The Papers of Will Rogers by Will Rogers. The book says he first came to the United States in 1889 still performing his act. But by the time the Houdini incident took place he was already established as an international agent. In fact, he was known by the moniker, The Globe Trotter. He not only found American acts for European audiences but also brought over European acts for American audiences. The book The Papers of Will Rogers page 205 further states "Pitrot was greatly respected by his colleagues for knowing the value of an act and by performers for his integrity in obtaining fair salaries." Another book which speaks of Pitrot's character is Forty Years Observation of Music and the Drama by Robert Grau. That book says "An agent more associated with foreign styles of acts is Richard Pitrot, and no man today stands in greater esteem." The book further stated, "His advice is sought by many before they embark for this country; he is also able to bring to this country any artist he desires without a contract. I have never heard of anyone complain of Pitrot nor has he ever been conspicuous in legal complications for breach of contract, such as is often the case with foreign agents." In Houdini!!! by Kenneth Silverman he mentions that Houdini wrote the words "Dam Liar" on a telegram dated May 29th 1900, sent from Richard Pitrot to Houdini. The telegram apparently informed Houdini that Pitrot would not be going with him to England, but that there were dates awaiting him. Houdini and Bess set sail May 30, 1900 on board the S.S. Kensington. This ship was part of the Red Star Line and arrived in England on June 9, 1900. When Houdini arrived, there were no gigs awaiting him. Several sources mention that the British bookers distrusted American acts. For example, page 81 of Houdini-The Man Who Walked Through Walls by William Gresham, he states "The Britishers were not impressed. They had been badly stung on some American acts and were not tantalized by clippings from American papers..." This quote was in regards to Houdini's pressbook filled with articles from American Newspapers. I'm just guessing but perhaps Richard Pitrot did set up a tour, but because the British agents were highly skeptical of unknown American acts, they did not keep their word. This is merely a guess on my part. But given the reputation of Richard Pitrot, it doesn't add up that he would just set-up Houdini for a fall. Interestingly, Milbourne Christopher's Houdini The Untold Story, implies that Houdini sailed to England knowing he would have no shows waiting but intended to get bookings on the power of his pressbook alone. There is no mention of Pitrot's involvement in most of the biographies, except for the Kenneth Silverman book where it would seem the discovery was first published. While in England Houdini continued to correspond with Martin Beck and was agitated by Beck's insistence that Houdini pay Pitrot's commission, even though Houdini arrived to no tour . This information comes from the Silverman book on HOUDINI!!! page 50. Would Martin Beck continue to insist Houdini pay the commission if he didn't believe in Richard Pitrot's abilities? It sure seems odd. But there is a bit more to this. 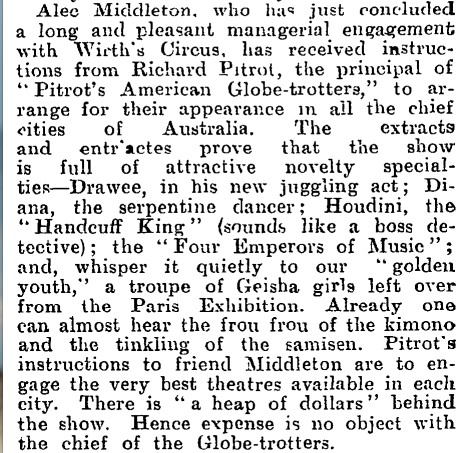 Apparently, Beck must have kept working with Pitrot to book Houdini overseas because I discovered two articles from New Zealand newspapers in 1901 that show Pitrot was still working to book Houdini. However, Houdini was still in Europe at the time so this did not happen. Despite this initial incident with Houdini, Richard Pitrot went on to have a very successful career as a show business agent. He died from diabetes on March 21, 1929 in NYC. I must thank the wonderful WildAboutHoudini.com for mentioning the name Richard Pitrot in his final article on TheHandcuffKings Blog. 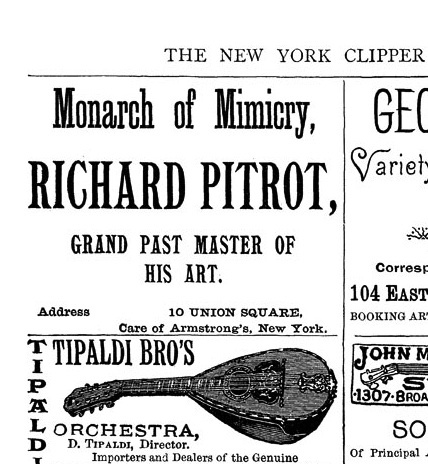 I couldn't recall the name Richard Pitrot, so I began the research and then wrote the piece above. Magnificent work, Dean! I'm going to link Pitrot's name in my story to this page. 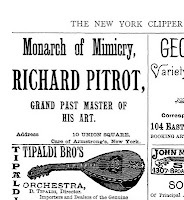 The NY _Telegraph_for Sunday, 9/15/1901, has an article about Pitrot and how he scouted acts in America for European theaters, and vice versa. In the article he talks about Houdini. Berlin, I urged the director to hold him for two months, arguing that he would be a better attraction the second month than the first. "The director did not do so, and when Houdini completely mystified the Berlin police and set the town talking the director bought off the man to whom Houdini was under engagement the following month, for something like $2,000. A couple of years ago, two weeks at a time would have been something important to the man." 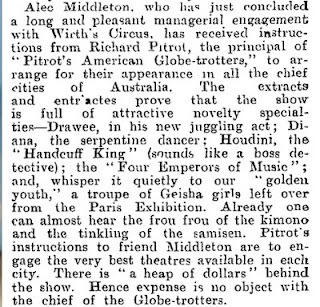 Houdini gives a neutral comment about Pitrot in his letter to the _Dramatic Mirror_ of 4/18/1903: "The Dollar Troupe of Acrobats leave for America March 14, having been booked by Richard Pitrot." THANK YOU for that contribution! That is awesome information.